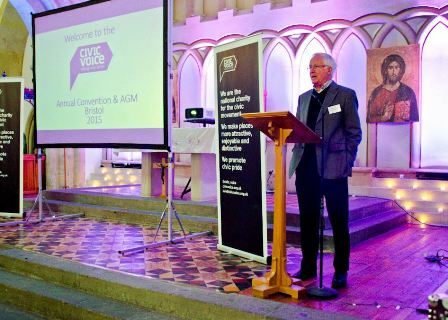 Bristol Civic Society hosted the 2015 Civic Voice Convention on 23rd and 24th October. The Convention was held in St James’s Priory and attracted over 100 delegates from all over England. 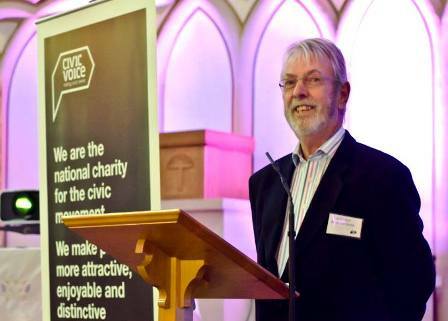 Civic Voice is the national umbrella organisation for civic societies throughout England. The Convention began with popular trips to the Clifton Suspension Bridge and to the Cathedral, followed by shorter visits to Kingsdown, Stokes Croft and projects in the City Centre. There was also a marathon three-hour tour of harbourside and inner city green spaces. The Convention dinner was held at M Shed, affording spectacular views across Harbourside. Delegates were fortunate to be welcomed by the Mayor and to have Civic Day awards presented by the Lord Mayor. Next year the Civic Voice Convention will move to Chester.